Coslys Organic Shower Gel with Honeysuckle cleanses dry skins gently with its soap-free lipid-enriched formula. No more irritations nor itching thanks to anti-inflammatory and soothing organic Honeysuckle extract and Meadowsweet floral water. Ideal for daily use, Coslys Organic Shower Gel leaves your skin smooth and soft with a nice 100% natural floral fragrance ! * "Surgras" means enriched in natural oil and glycerin to protect skin from drying because of calcareous water and thus preserve the natural hydrolipidic layer. 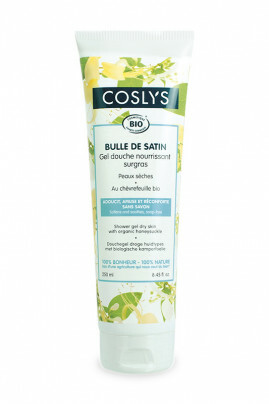 Un gel douche tout doux pour la peau! Encore plus flagrant quand on passe d'un gel douche tout cracra à celui-ci, la peau dit un grand merci. Ne laisse pas la peau grasse, se rince bien, petite odeur un peu bizarre au début (chèvrefeuille, je trouve pas ça couramment dans les produits d'hygiène perso) mais vraiment très agréable. Un vrai moment de douceur sous la douche! Apply COSLYS Organic Honeysuckle Shower Gel on damp skin, lather then rinse. In case of contact with the eyes, rinse abundantly. Aqua (water), spiraea ulmaria flower water* (organic meadowsweet floral water), sodium coco-sulfate (anionic surfactant from coconut, palm-kernel and wisteria), lauryl glucoside (anionic surfactant from glucose), stearyl citrate (alcohol ester and citric acid), polyglyceryl-2 laurate (lipid-enriched agent from palm-kernel and coconut), lonicera japonica (honeysuckle) flower extract*, coco-glucoside (anionic surfactant from coconut), glyceryl oleate (anionic surfactant from copra, sunflower oil, glucose and plant-based glycerin), cocamidopropyl betaine (amphoteric surfactant from coconut), benzyl alcohol (preservative agents), sodium lauryl glucose carboxylate (anionic surfactant on sugar-based), parfum (100% natural fragrance), sodium chloride (salt), coconut alcohol (coconut alcohol), sodium sulfate (anionic surfactant from coconut), potassium hydroxide (pH regulator), dehydroacetic acid (preservative agent), oryza sativa extract* (organic rice grain extract), sorbic acid (preservative), leuconostoc ferment filtrate (ferment), superoxide dismutase, soybean peroxidase, benzyl salicylate (preservative system), geraniol, limonene, linalool (components naturally present in essential oils). Une odeur à tomber pour un gel douche d'une grande douceur pour la peau. La texture légèrement gélifiée permet de ne pas perdre de produit (par rapport à un gel douche trop liquide). J'adore!